I saw a YouTube video the other day that made me fall off my chair in laughter and self-conscious surprise. The video is about me, about my friends, about my neighborhood. It is a rapid-fire five-minute episode of one man’s explosively misdirected but well-intended attempt to save the dwindling rainforest, but his admirable intentions fall flat and do more harm than good. In his own comfortable suburban realm this 30-something-year-old main character tries to “Do Good”. He drives a Prius, recycles, spends time with family, gives to charity, and tries to be a good docent of planet Earth. He’s a bit of everyone. He’s trying. Except this gentleman flies off the handle and stops doing good in a reaction to the rainforest decimation. He decides to singlehandedly go and try to save the rainforest. It is disastrously comical. In the attempt to save millions of acres of wilderness he quits his job, abandons his wife and child, and nearly kills himself trying to be the hero. Not Good. There’s a point to the story and there’s a brand awareness that’s being proffered. I’ll get to that later. Let’s talk about our everyday attempts to Do Good. I like how some fast food places are taking us by the hand and offering us an easy way to Do Good. Chipotle and Costco display well-marked bins that describe exactly what items go in which bin. Plastic cups here, tortilla chip bag there. Easy. I just did a “Do Good”. Of course there’s that nagging guilt trip sign labeling the Scorn Bin called “Landfill”, like “Hey Planet Killer, this is where you dump your Bambi-Death-Uranium-half-life fork you used for 60 seconds while polishing off your veggie burrito, you slime ball.” Sometimes I just feel like singing “I Do Good, I Do Good” in the face of the “Landfill” sign, and file away my compost and recycling with zest. Other places like Starbucks could stand to offer a waste sorting tutorial though, sanctimonious or not. There is no “Paper cups go in compost”, “Sugar packets in recycling”, “Lids go in the Planet-killer-Bambi-death bin”. I still hover over the waste bins at Starbucks with my wooden stir stick going “Bambi killer” or “Earth goddess food”? A picture would be nice, too. Yeah, I’m that simple – especially when I haven’t had my coffee yet. Highlands resident Lacey Leigh is known to “Do Good”. She excels at it, as a matter of fact. 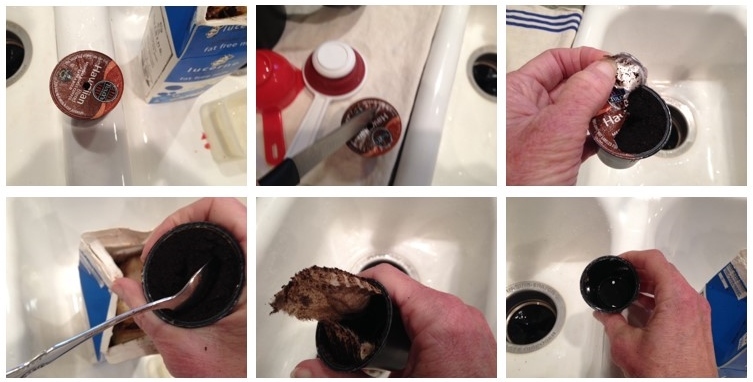 Being one of over 13 million household drinkers of single-serve K-Cup® coffee, the Ashland Park Leighs have sorting the pod waste down to a science. It took some research to determine their sorting solution for those plastic cup/aluminum foil/paper filter combo pods, but the need was there, considering they went through at least 14 per week. Without being divided up, the coffee pods can only be thrown in the trash. In a simple six-step process (as seen in the illustration), this tuned-in family dissected a K-Cup® and discovered four separate entities that could be deposited into two bins. First comes the aluminum foil lid (recycling), then they spoon out the spent coffee grounds (compost), next they extract the paper filter (compost), and finally after rinsing the residue they chuck the plastic cup into recycling (we hope). Too much for so little? Well, if Costco is trying so should we, right? Or at least we should spend a minute here and there thinking about where our waste is going.